A daily round-up of the human impact of demonetisation. According to Firstpost, the announcement of demonetisation hit the rural economy at a very crucial time. The lack of cash coupled with a limited access to digital methods of payment led to farmers not being able to procure high-quality seeds for the rabi season or sell the crops from the kharif harvest to make a healthy profit. According to a report in The Hindu, potato farmers from Haryana and Punjab have been badly hit by demonetisation. Farmers are struggling to recover input costs as prices in the market have fallen to record lows. The fresh potato crop has arrived in markets, but due to the cash crunch, the potato seed industry is expecting a loss close Rs 800-900 crore this year. Farmers from Punjab have written a letter to the prime minister on Wednesday, asking him to waive their crop loans. In another report by The Hindu, ginger farmers in Karnataka have endured a hard season which is set to continue. The process of climate change has already affected yields, but due to the lack of cash in circulation, prices of 60 kg bags halved from last year. Growers fear that the present crisis will affect the cultivation of the crop next season as well, as preparation for the next cycle of cultivation should begin by the middle of January. They need cash for preparing their land, purchasing seeds and other spending. In a study of Gujarati rural markets, Indian Express reported on farmers and traders who have been affected by demonetisation. 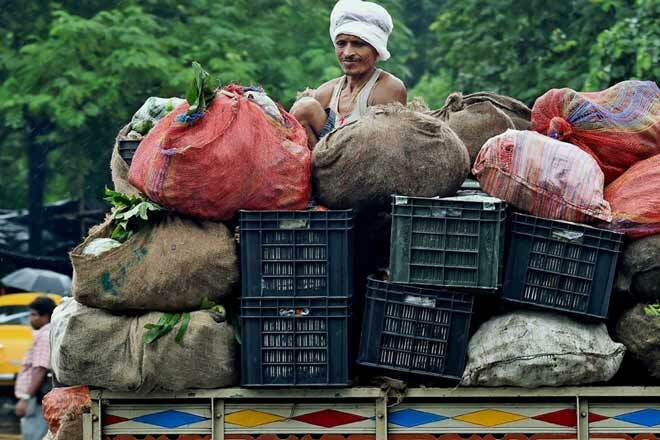 Crop arrivals have plunged to 15% of the normal, agricultural produce market committees spread across the state have said that farmers and traders have been losing out on profits in the peak season. Bakul Savaliya, a farmer from the outskirts of Gondal, 40 km from Rajkot city, said that the 50 kg of carrots that he brought fetched a mere Rs 4/kg. He further added that he couldn’t cover labour and sowing costs at these rates. India has 104-million strong tribal population, which accounts for 8.6% of the total population. Prime Minister Narendra Modi’s idea of a ‘digital India’ is detached from the realities of many of these people. A report by Business Standard showcased how the push for digitalisation will leave a number of people behind. In a study of the state of Madhya Pradesh, which has the highest percentage of tribals in the country, the report pointed to the vast differences between the tribal population and the rest of the people in the country. Using interviews along with the 2011 Census data, the report emphasised that the tribal population has a lower literacy rate on average, reduced access to banks and a lack of cellphone connectivity. On all three parameters, the tribal population seems to be the group of people hardest hit by demonetisation. The famous chikankari and zardozi businesses of Lucknow have suffered. Usually overcrowded markets like Ameenabad and Chowk are witnessing much less footfall in the past month. Weavers complained that the lack of cash has severely affected their businesses and e-payments are difficult as the workers they employed do not have access to online banking services, Indian Express reported. The Nadia Jute Mill in Northern Bengal closed down, adding to the number of mills that have closed down in the past month. The failure to pay workers’ wages was followed by a halt in electricity supply, which eventually forced the management to shut down the ailing mill. Ram Pravesh Singh, representing National Union of Jute Workers said the management did not pay salaries to workers on December 10, citing demonetisation, according to The Hindu. In Nagpur, demonetisation has made it difficult for schools to manage the Mid-day Meals Scheme (MDM), as some of the crucial raw materials are purchased in cash. An official who works with the scheme cited that schools who are part of the MDM are extending their line of credit when purchasing materials to prepare the food. Schools are functioning on a tight budget and at any given time a supplier could pull out of the chain of production because the extended line of credit is eating into their profits, according to a report in the Times of India. Administrators of schools are worried as demonetisation has affected staff payments and salaries. The Hindu found that parents have been unable to pay school fees on time due to the cash crunch. The delayed payments have affected the daily workings of schools. Vivekananda Vidyanikethan educational institutions chairman S. Komuraiah said they were pleading with parents to pay at least monthly fees instead of term fees, but parents weren’t able to do so as they do not have adequate cash. Adding to the slew of violence against bank employees, locals in Jangethi village in Meerut were infuriated at the announcement that cash wasn’t available. After waiting for hours outside, the locals were informed of the lack of cash, which provoked them to forcibly enter the bank. The incident occurred at the local branch of Syndicate Bank where locals caught hold of manager Pavan Kapoor and other staff. In a similar incident, staff at the Indian Overseas Bank in Mathura were held captive by an angry mob over the lack of cash on Wednesday. The mob also resorted to stone-throwing and vandalised the bank, according to a report in The Hindu. In an interview with Business Standard, Harvinder Singh, general secretary of the All India Bank Officers Confederation, attributed many of the problems people and banks are facing to the constant changes in policy. The notification issued by the Reserve Bank of India yesterday was the 60th of its kind since November 8. He further added that the RBI was not in touch with ground realities and in some cases was even showing a bias against private banks, which caused more discomfort to the customers of these banks. The lack of regular distribution of cash and lack of recalibration of ATMs showcased the unpreparedness of the RBI, he said. According to a Business Standard report, Assocham has said that trade in major clusters of leather and leather products in India has been hit hard by the union government’s move. The association had interacted with representatives of about 100 tanneries in major leather clusters – Agra, Chennai, Kanpur and Kolkata – and found that butchers aren’t being paid for the animal skin they provide, nor are the tanneries able to pay for transportation. Production has come down by 60-75% and a number of factories have closed down in these cities.